After the Sturmey Archer bullet lamp was stolen from my wife's 1966 Raleigh Superbe and my rage (which I documented on Craigslist) had subsided, I decided it was time to get working on a new lighting project. I had also been eyeing my Mom's 80s Raleigh Sprite mixte that was sitting neglected and dusty in the garage for years. 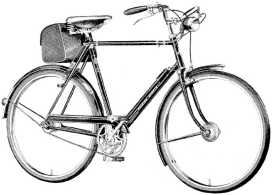 My wife complained her Superbe was heavy and clunky (it was), and the elegant and lighter mixte was a better size and the frame was in much better shape than the beat up old Superbe. I planned to fix it up, and a new bike was a good excuse for a new lighting system. One thing that impressed me about the first system I built was how incredibly bright the rear lamp was. It was easily as bright as a the tail light of a moped, if not brighter. My night riding is primarily done in the city where I feel especially vulnerable in traffic from behind, where, of course, I can't see what's coming. Most bicycle lighting (and especially the premium kind), both battery and dynamo-powered, is focussed on the head light. People take painstakingly staged beam shots of their commercial and homemade head lights using the latest and greatest Cree emitters and optics. There seems to be a great amount of interest in the design, output and illumination patterns of head lamps. As I don't often find myself careening down steep hills in the woods or mountains on moonless nights, I must admit that I don't share this fascination with my fellow bike light aficionados. I do, on the other hand, fret quite often about getting mowed down by a car coming at me from behind as I wait to turn left at a traffic light in the city. So, in my lighting system I plan to devote as much or more attention to the design and output of the tail lamp. First and foremost, I want the tail lamp to be bright. Really, really, really bright! Second, I want it to be diffuse, so it can be visible from a wide angle. Most commercial tail lights fail rather miserably at being both bright and visible at a wide angle. Typically, they use multiple low power LEDs with optics to produce a bright but narrowly focussed beam. I also want to be able to fit the LED and its associated circuitry and heat sinking into a variety of vintage tail lamp housings, which are considerably more elegant than contemporary offerings. I'm especially fond of fender-mounted tail lights. Almost every cyclist uses a flashing tail light for urban night riding. 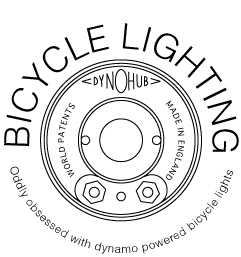 That's just what's been marketed to us by light makers and it is now the unofficial standard of North American bicycle lighting (blame the half-decade ubiquity of the knog or the superlfash!). As a consequence, it's what both cyclists and drivers are accustomed to. That said, in cases where flashing lights are not appropriate (avoiding arrest on cycling trips to Europe or long night rides with other cyclists, for instance), there's a requirement for the flasher to be disabled. During my design process, I discovered one reason why light makers haven't bothered to make a flashing dynamo light. Turns out, they are kind of difficult to implement. The big issue is what to do with the power of the dynamo during the off cycle of the blink. Dynamos are essentially constant current devices and their voltage is primarily determined by their speed and the resistance of the load. So, disconnecting the load (during the off-cycle of a flash) causes the dynamo voltage to spike, which has the potential to make things smoke! After much effort, though, I now have a working prototype of a dynamo-powered flasher, the details of which I'll post soon.